Normal numbers of oocysts are formed. However, day 10 and 14 oocysts had a reduced size (`60%) compared to wild type oocysts. A large (~10-20-fold) reduction in the numbers of midgut-associated sporozoites was observed. No hemocoel or salivary gland sporozoites were detected. A large (~10-20-fold) reduction in the numbers of midgut-associated sporozoites was observed. No hemocoel or salivary gland sporozoites were detected. No mosquito transmission. Localisation of parasite uroporphyrinogen decarboxylase (PfUROD) by immunofluorescence microscopy. Co-localisation of PfUROD with porphobilinogen deaminase (PfPBGD). 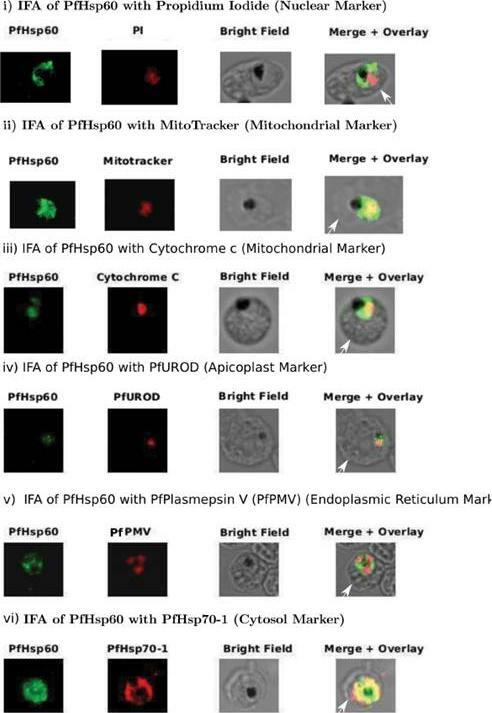 Antibodies to recombinant, truncated uroporphyrinogen decarboxylase (r(D)PfUROD) were raised in mice, while PfPBGD and PfHSP60 PF10_0153 antibodies were from rabbit. To study co-localisation, tetramethylrhodamine isothiocyanate (TRITC)-conjugated goat anti-mouse IgG and FITC-conjugated goat antirabbit IgG were used. IE, infected erythrocyte; P, parasite; H, hemozoin. Scale bar = 5 mm. 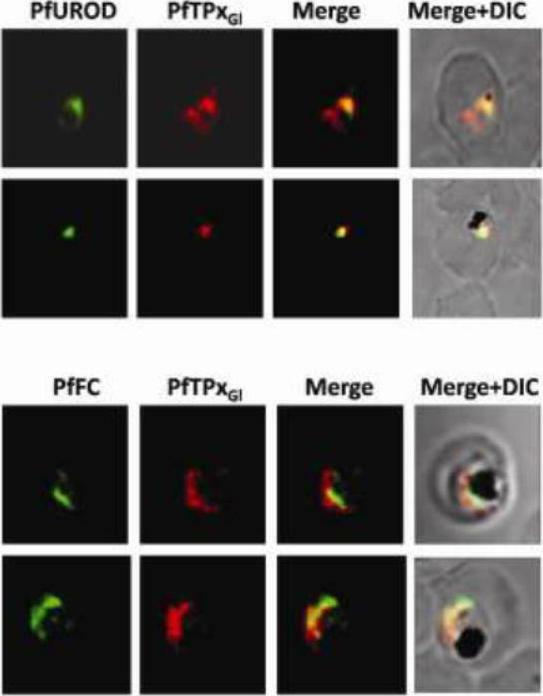 PfUROD co-localised with PfPBGD but not with PfHSP60 (a mitochondrial marker). 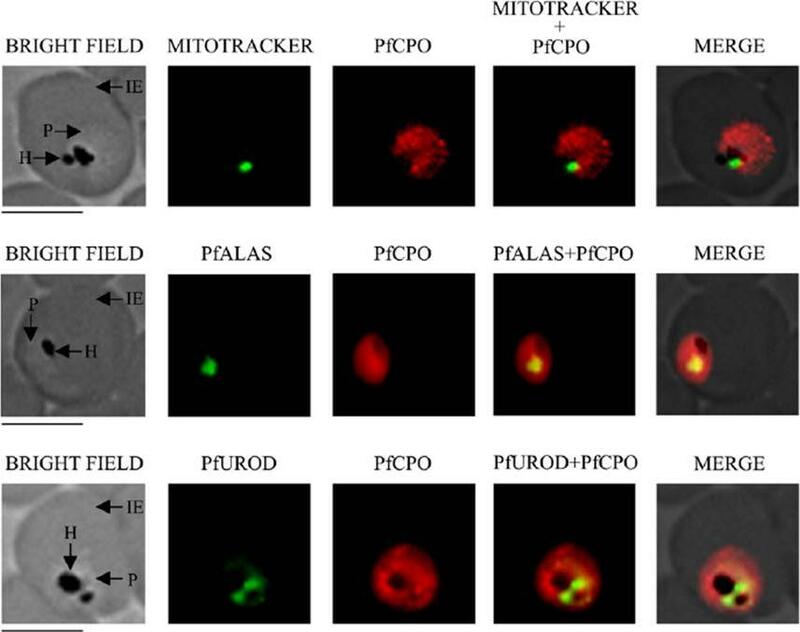 Therefore, it can be concluded that PfUROD is localised in the apicoplast and not the mitochondrion.Nagaraj VA, Arumugam R, Chandra NR, Prasad D, Rangarajan PN, Padmanaban G. Localisation of Plasmodium falciparum uroporphyrinogen III decarboxylase of the heme-biosynthetic pathway in the apicoplast and characterisation of its catalytic properties. Int J Parasitol. 2009 39:559-68. Copyright Elsevier 2010.